I’ve completed my pilgrimage to Taranaki. 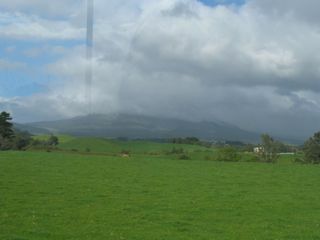 After flying in to New Plymouth, I took a shuttle to connect with the one bus per week that goes to Opunake, on the far side of the mountain. Taranaki is a circle, with the mountain in the middle. The first thing I do when I go back there is look for the mountain. It was hard to find, but the many lahar mounds on that side were rising up thick and fast as the bus drove onwards. Through the bus window, I kept searching for a glimpse of this beloved cone that inspired me throughout my childhood. But all I could see was its base. Its head was in the clouds, and I heard that snow was falling. I wondered if my old teacher would be hard to find also, if he was lost in the mists of oblivion. Even the photo, shown to me by the Rest Home matron, could not be re-photographed successfully because it was behind glass. There he is, second from the left, the handsome young teacher whom I knew. He was one the the first Maori teachers to be trained for mainstream schools. 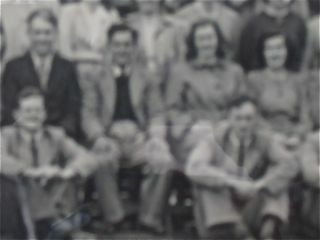 Here he is amidst his fellow-trainees at Ardmore Teachers’ College. My old teacher knew me immediately. We exchanged a long hongi (the nose to nose greeting of Maori), and with it the exchange of the breath and aroha (love) that we have shared for so long. 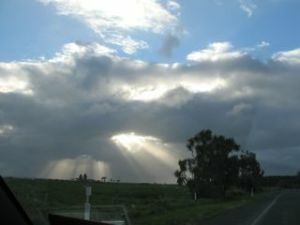 The next morning, after an evening of rich conversation, tears and laughter with an old friend back in New Plymouth, I was driven to the airport. My friend caught sight of something in his rear vision mirror and stopped the car at the side of the road. ‘Get out and take a look.’ and there it was at last, my beloved mountain, Taranaki. When I was with Jim, my teacher, I sang some of the old songs he taught me, and he joined in. We were together as the years and clouds rolled back. Arohanui. It was a big journey, in every way, and worth every step. The essential task is to feel the thrill of completing your pilgrimage. . . . There is joy in having arrived, moment by moment. Phil Cousineau, ‘The Art of Pilgrimage’. Oh what a blessing Juliet – you were looked after every step of the way. To see your teacher, your mountain and share laughter and tears with an old friend and the gift of you for them and them for you. Thank you for sharing your pilgrimage. Oh what a blessing Juliet – you were looked after every step of the way. To see your teacher, your mountain and share laughter and tears with an old friend. The gift of you for them and them for you. Thank you for sharing your pilgrimage. Thank you Sue, it was everything I could have wished for. Blessings indeed. Hi Juliet .. your teacher does sound inspirational .. and he found a kindred spirit in you. Lovely that you were able to have this time together .. and then to see your Taranaki too – it is a magnificent mountain ..
To have such a long, sustaining relationship with your teacher is a wonder, Juliet. To have visited with him at this time, shared songs, words, and the traditional Maori greeting seems a miracle to me. I almost wept at the clouds lifting and your beloved Taranaki appearing as if to bid you safe travel home. Gifts come in so many shapes and forms, don’t they, as well as the art of giving, which is what your gave your teacher in your visit. I will think of you and your visit this day. I will think of your teacher and lessons learned. A wonderful story of pilgrimage, Juliet. 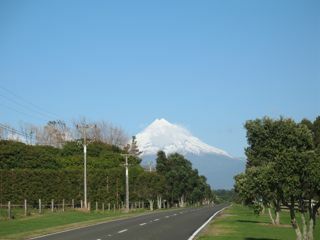 Another friend of mine also made a pilgrimage to Taranaki this week. I hope she’s seen the mountain too – it’s so very special. *Hilary, the mountain is magnificent indeed. I feel so lucky to have grown up with this mountain, & such a special teacher. Thank you. * Penny, miracles and gifts. Yes. I felt blessed every step of the way. Thank you for sharing in this so fully. * Ruth, your friend probably did get a good view of the mountain. It was Saturday morning when it appeared. Thanks. * Charlie, it is a beautiful part of NZ indeed. 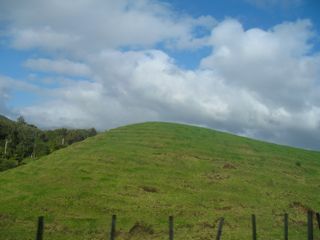 Ocean, mountain and lush green farming country. Quite a combination. Thanks for visiting. Am so pleased that the trip went well and you were able to connect so closely with your inspirational teacher. How fitting that the mountain appeared for you just as your very moving journey was coming to an end. *Anne, it was such a thrill to see the mountain at the last minute. Thank you. Such a special time, Juliet. A beautiful post – both momentous and momentum filled. It is so significant (and comforting) when heartscapes are warmed by both the important people in our lives, and the key landmarks of our biography. It’s a privilege for us readers to hear of how both Jim and Taranaki weave through your life and work. * Ruth, what a lovely comment. Heartscapes is such a good word for what has been activated. Thank you. What a wonderful post Juliet. I felt so happy to read the mountain showed itself. My sister and I felt the same about Mt Aorangi and we watched to see whether Taranaki would also show as we flew home..and there it was surrounded by cloud but quite visible. Beautiful mountains. Joan, how nice to have you visit, and to hear about your mountain watching as well. Thank you. I found this quote in a little book I was given many, many years ago and it seemed relevant to your journey and the mountain and the great teacher you have been to visit. Lynley, that’s so beautiful. Thank you.